i’d played through and enjoyed the version of pac-man arrangement that appeared in the collection, and even at that time i’d had my doubts about another game in the collection, the 3D novelty pac-mania. nevertheless, i decided to give it a closer look, and although none of the reviews i’ve read about the GBA version say much beyond that it’s a 3D version of pac-man in which the man has the ability to jump, it soon became pretty clear to me that this game’s port to the GBA makes the game extremely frustrating. first off, gamespot’s reviewer’s comment that “… the GBA’s screen is zoomed in a little more closely than that of the arcade version” is a complete understatement. like the GBA-ized pac-man arrangement, pac-mania pretty much cuts the size of the original screen in half. this made the former harder but certainly not unplayable, as you still had a pretty good sense of where the four ghosts were at all times and it was fairly easy to find any stray dots you had left behind. but since the original pac-mania was already set to a zoomed-in view so that you could only see about 1/4 or 1/5 of the board at a time, halving that means that in the GBA version you’re only seeing about 1/8 of the board at a time. this is a huge disadvantage, and you’ll find that you’re constantly running headfirst into ghosts. the original game ameliorated the fact that you have a limited view of the board by making the ghosts’ movements more predictable and by laying out routes that the ghosts tend to follow. this certainly would have helped balance the original game, but it definitely wasn’t enough to compensate for the drastically smaller view in the GBA game. and besides, with the smaller view it’s much harder to even recognize the patterns in the first place. given more time i may have more fully mastered the details of the ghosts’ patterns, but by that time i was already frustrated by the other feature inherent in both versions of the game: the number of ghosts. in both versions of pac-mania the boards take longer to navigate than most other pac-man games (e.g. the original pac-man and ms. pac-man) just by the nature of it being in 3D, so to make things more challenging the game adds more ghosts than the usual four. the number of ghosts varies but it quickly ramps up to 6 or 7 and reaches its maximum of 9 at the 23rd (and final) stage. i can imagine that avoiding all those ghosts would have been barely manageable in the original version, but in the GBA version the number of ghosts makes things completely impossible: in these later stages there are ghosts everywhere running around at full tilt, and because you have no idea where they are poor pac-man is constantly getting tackled, sandwiched, and headbutted. unfortunately those weren’t my only complaints. the game includes two types of ghosts that jump, one green and one dark blue, but oftentimes in the midst of the frenzied gameplay the dark blue one looks too similar to the regular blue one and the purple one. this may also be more manageable with a bigger (and better-lit) screen than the GBA’s. another drawback is that there are only 4 boards, and one of those is the regular classic pac-man board. also there are two powerups, one that works as a short power pellet (but with added points) and one that gives a speed boost, but they show up relatively rarely and it’s too hard to get back to the center of the board to collect them, so the majority of the time it’s just not worth the effort. on the plus side, though, the game offers unlimited continues, and as with the other games in the collection it lets you change some settings, one of the more useful being that you can choose to end the game after 11 rounds instead of 23.
all in all not a great gaming experience, unfortunately. i don’t doubt that playing a full-screen version will definitely be a big improvement (there’s also an NES version that i’ll have to check out at some point), but even then i don’t see this as becoming a great favorite. 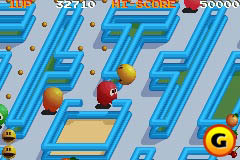 the game was a nice change of pace, though, for the series, and i’m still as big a pac-man fan as ever. i’m betting that my next pac-man game will be a much more enjoyable experience.